I remember the first time I bit into one of Smokestak’s infamous brisket buns with pickled chillies like it was yesterday. It was also the first time I’d entered Street Feast in Dalston. Since those glorious days, Smokestak has come on such a long way! 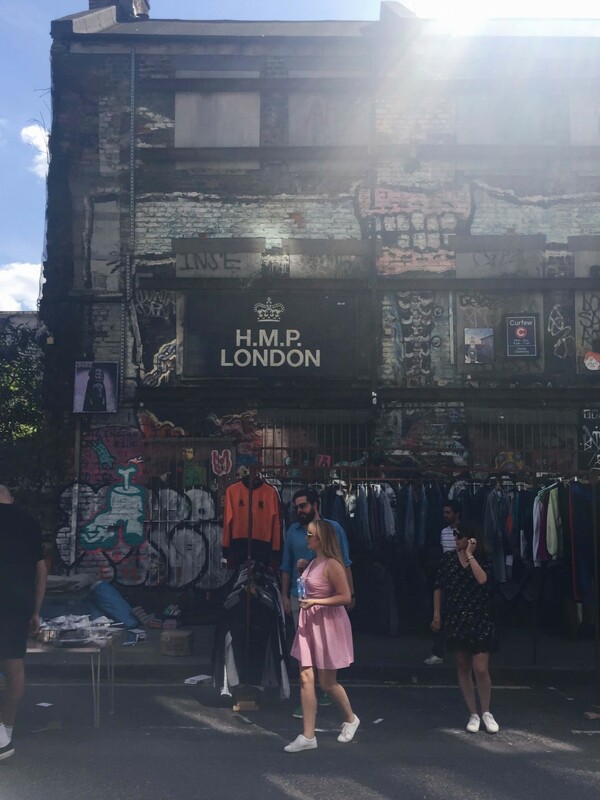 They opened their permanent home on Sclater Street, just off Brick Lane and moments from Shoreditch High Street station, last year to big applause. I took my husband earlier this year for his birthday, on the first day they were open after their Christmas break. It was the first time I was dining at the new restaurant and I was excited to finally try their full menu! But to be totally honest, I left feeling a bit indifferent about the food. I think we actually over-ordered on the meat (our eye are always too big for our bellies) which meant the whole meal was just too rich for me. And being 3rd January it was very quiet with little atmosphere in there. Neither of these being their fault at all, but I left not being fussed about returning. This Sunday changed all of that! I’d made plans to meet with a good friend at Shoreditch High Street Station. The plan was to have lunch, but that is where the plan ended. It was a glorious sunny Sunday and we decided to wander down towards Brick Lane. The market on Sclater Street was in full swing with music playing and people shopping. 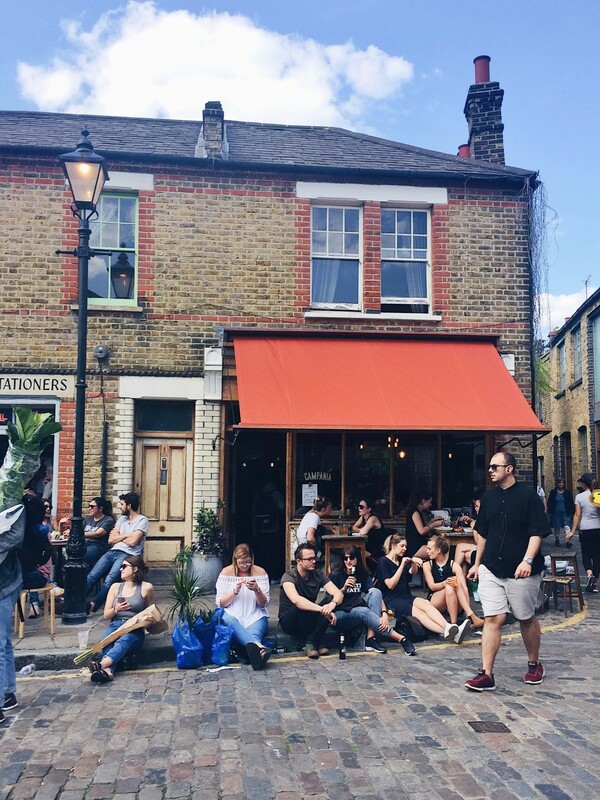 We noticed all the tables outside Smokestak and thought it would be the perfect place to eat, enjoy the sun and people watch. I mean, what more could you want! Inside, everything is very dark and broody and so very Shoreditch. Chunky wooden tables, lots of dark metal and dark walls with dusty windows. It’s definitely somewhere to take cover when it’s cold outside, but the tables outside mean you can enjoy it on lovely sunny days too. 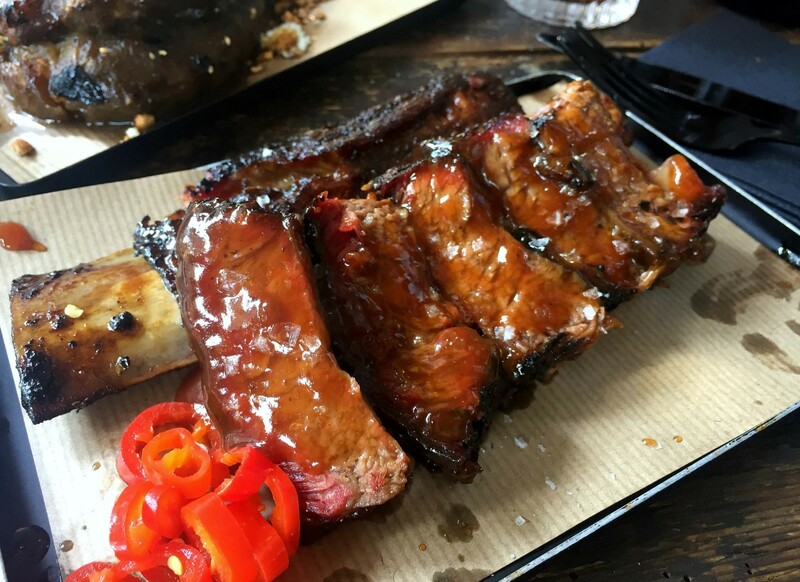 Smokestak not only know how to cook meat, they bring it on the side front too! 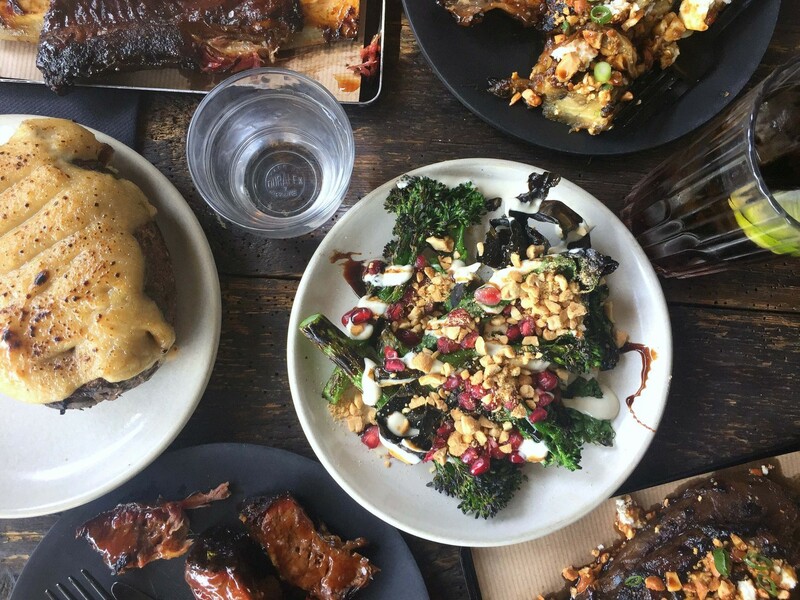 The menu at Smokestak is split into 5 sections: bites, small plates, large plates, sides and desserts. Meaning you can mix and match pretty much the whole menu, my kind of dining! Where do you start? With the meat of course! Depending on how many of you are dining, usually I would say one to two portions of meat between two people. 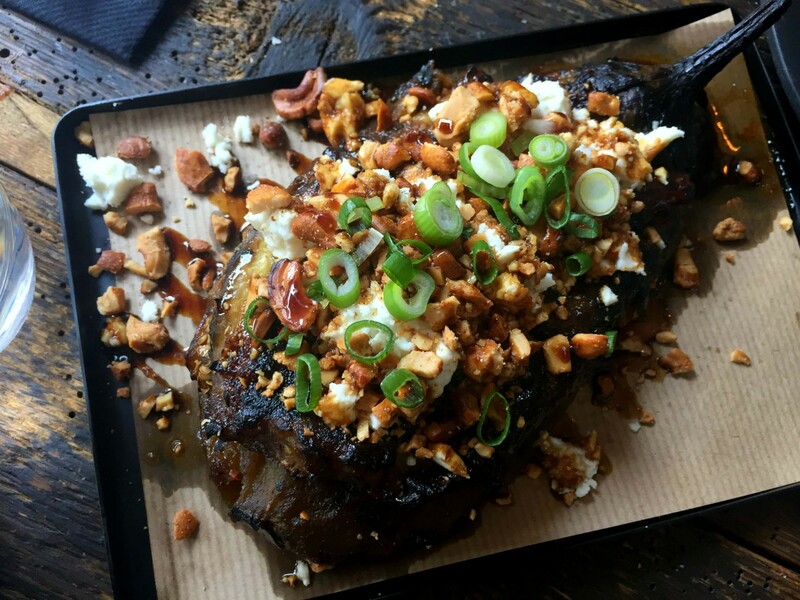 However, at Smokestak the portions are very generous so make sure you come hungry! We decided to go in for one portion of the big stuff, the 30-day dry aged beef rib with my favourite pickled red chillies. Part of the reason we only ordered one meat dish was because Smokestak absolutely nail their veggie and side dishes! I’ve mentioned before how I’m cutting down my meat intake (this meal not included, obviously) but honestly, even thought the brisket was so damn delicious, I would have been happy with no meat too. Their vegetarian dishes are that good! 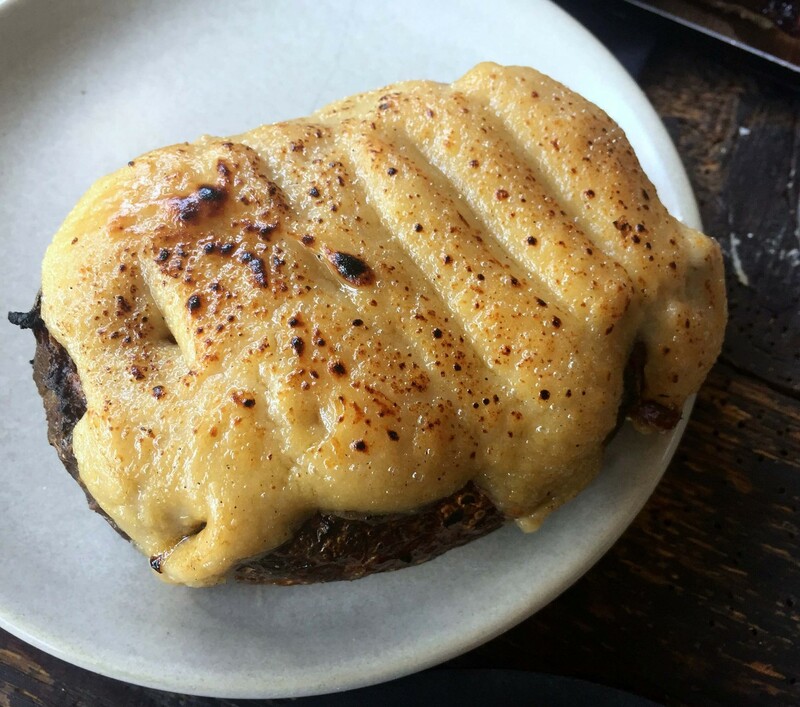 I’d tried the jacket potato smoked rarebit on my last visit and so quickly put this on the list of dishes again. It’s almost like the potato is taken out of the skin, whipped, put back in and topped with cheese. It’s heaven in the guise of a potato. The coal roasted aubergine with red miso is gooey and sweet. I love the amount of toasted cashews on this dish as they add such a great texture. Another star of the meal for me was the charred greens with tahini, pomegranate and roasted nut. I’m having a bit of a tahini moment right now and love it on most things! I don’t know what else was in the dressing but it was so creamy and luscious. Although nice and full by this stage we were going to order the sticky toffee pudding as we’d been eying up the burnt butter ice cream it came with. But unfortunately they were out of the ice cream! So no dessert for us. Which was probably a good thing! We wandered down Brick Lane, picked up a coffee and carried on walking and talking our way around Columbia Road just in time to catch the end of the Sunday flower market. A pretty perfect way to spend a sunny Sunday, don’t you think? I loved our meal at Smokestak. Their menu is comfort food at it’s absolute best. Yes, we came here for the meat, but don’t neglect the sides when you visit. They are exploding with different flavours and textures and are anything but boring. Where is your favourite restaurant for Sunday lunch near Brick Lane? I can’t believe I haven’t gotten there yet! I always get their ribs at Street Feast so I’m sure I’d love the restaurant. That aubergine dish sounds lovely too. Great pictures! Thank you! Yes, if you love their food at Street Feast you’ll love the restaurant. I highly recommend a visit! 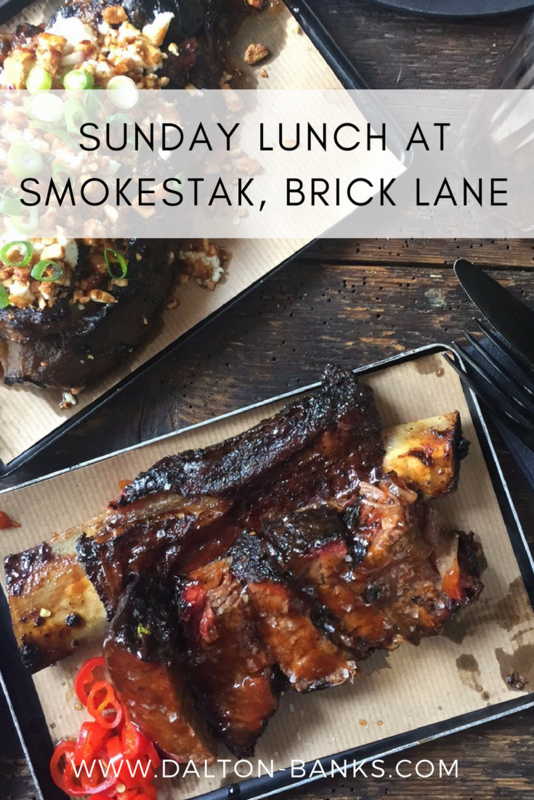 I went to Smokestak on Monday (review coming soon) – it’s so tasty! We managed to nab a table outside in the sunshine, although the people watching wasn’t great as no market, but nice to be outside! Yes, the outside seating is such a bonus. It was a lovely spot for a sunny Sunday. The food is just so good isn’t it! It is really good. But I have to say, it’s one of few places I’d be happy going all veggie! The aubergine was delicious and the sides are so generous and seriously tasty!